We arrived at the MALE airport at 9:00 am on January 6th, 2016. The boys from Gili Lankanfushi were waiting for us at the exit, ready to invite us to climb aboard the boat for the 20-minute journey that would take us to the island. Immediately we put on life-jackets and they took away our shoes. In Gili Lankanfushi there is a policy of “No News – No Shoes” so they took our shoes away and offered us a cold drink of “Ginger Fusion” that helped us to cool off. At the same time, they sprayed our feet with scented water and gave us wet towels that came at a great time after such a long trip. Along the way we saw a pod of dolphins that welcomed us and the boat driver was friendly enough to stop and let us take pictures. When we reached the hotel, a few members of the team were waiting for us on the pier, among them were Nuaas, Tammy and our dear Mr. Friday (Gasim). They welcomed us and took us on a golf cart to our room. On the way to our room, Gasim gave us a tour of the island that lasted about 10-15 minutes and explained to us where everything was located. 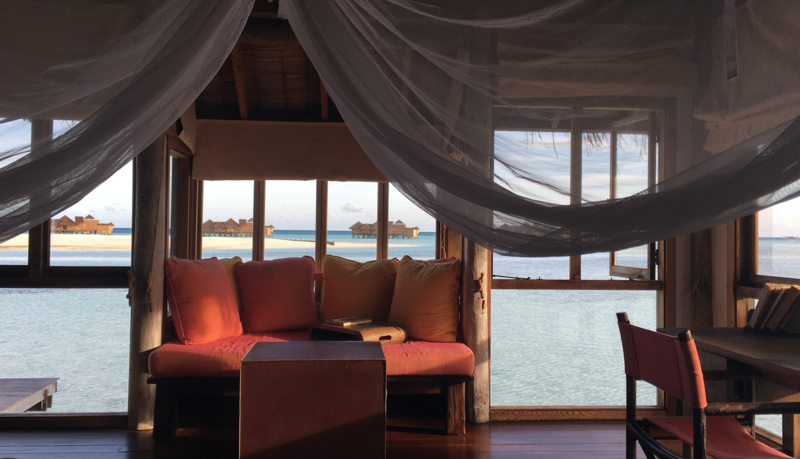 It should be noted that at Gili Lankanfushi there isn’t a “reception” per se, everything takes place in your villa. 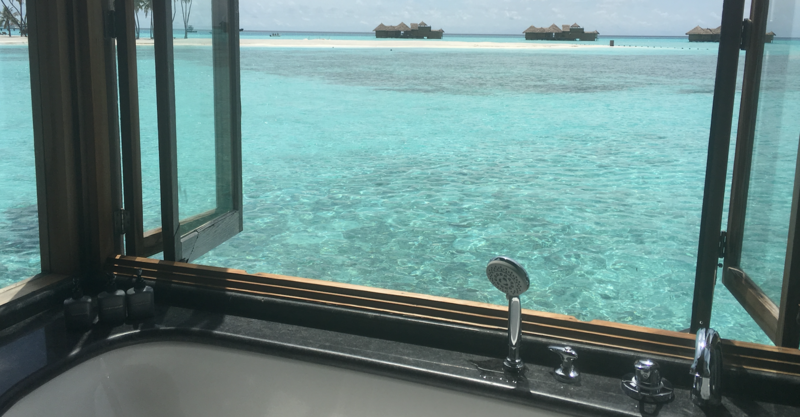 This is wonderful because normally, after a long trip, the last thing you want is to sign in at reception and all you want is to take a dip in the crystal clear waters of the Indian Ocean. Before continuing, and for the people asking why Gasim is called Mr. Friday, it’s important to know that the “theme” of the hotel is to make the guests feel as if they were Robinson Crusoe, on a lost island but with all of the luxuries of a 5 star resort in the Maldives. In the tale, Crusoe saves Mr. Friday from the hands of the cannibals and teaches him how to speak English, to eat goat meat (instead of humans) and converts him to Christianity. Mr. Friday is Crusoe’s best friend and this is how they want the guests to feel, as if they could count on their best friend. Mr. Friday left us at our water-villa and showed us around. It took approximately 10 minutes to explain where everything was and how to use it. We didn’t have to fill out any paperwork or leave our credit card, everything would be taken care of at the end of our stay. When he left, we explored the enormous villa. It had a huge bedroom with a king-sized bed, air conditioning, television, a desk and a fan. In the bedroom there was a Bose music system that controlled the entire villa audio system. The “living area” was in the center of the villa with a fridge, two beds for resting during the day, the dining room table and access to the tanning platform. At the other end there was the bathroom. It had a bathtub with views of the sea, two sinks and giant open closets leading to a corridor on the water with two showers at the back. There was also a staircase that allowed us to access our own “private” pool of seawater and we could swim there without being seen by a stranger’s eyes. However, the most striking of it all were the views from any angle of the villa. The views of that crystal clear water against the background of coral would take anyone’s breath away. Finally, some stairs gave way to a big terrace with beds where the views were even more impressive. Oh, and you can’t forget about the free Wi-Fi in the villa and around the entire island. The first thing we did was order something from room service and lay in the sun beds. With the sound of the music in the background and the noise of the sea, we fell asleep. The following day we went to breakfast. But, what is there to say about breakfast? There was a wide assortment of options and included everything imaginable for the eastern and western traveler. What most impressed me was the selection of honeys (around 20) that I used to put on my porridge. In addition, they had all the fruits you can imagine plus my favorite fruit, the mango, which was sweet as honey. As I also really like juicing, I focused on the pre-made juices that were different every morning. They always made fresh squeezed orange juice and after, a combination of vegetables and fruits. Of course, you could also ask for your own combination. Also, something interesting were the “shots” to energize, revitalize and detox, something that I had never seen before at a hotel. The second day, we went to the Spa at 7 in the evening just when the sun was beginning to hide. We were separated in two rooms. The beds had a glass floor and you could see the swimming fish while you received your massage. They opened the windows and let the night breeze in. We could hear the sound of the waves crashing on the reef and see the emerging stars as the sun disappeared. It was a scene like something out of a movie. We were given two therapists, one from Bali and the other from Thailand, and it goes without saying that the massage was out of this world. When the massage was over, they invited us to go upstairs and enjoy our mint and ginger tea. We had a half-board package which included dinner. Lunch we figured out on our own, either at the villa with room service or just going to the pool to get something to eat. The dinners were also great and every day there was a theme. I can’t remember them all but the Mediterranean and Indian ones stood out to me. 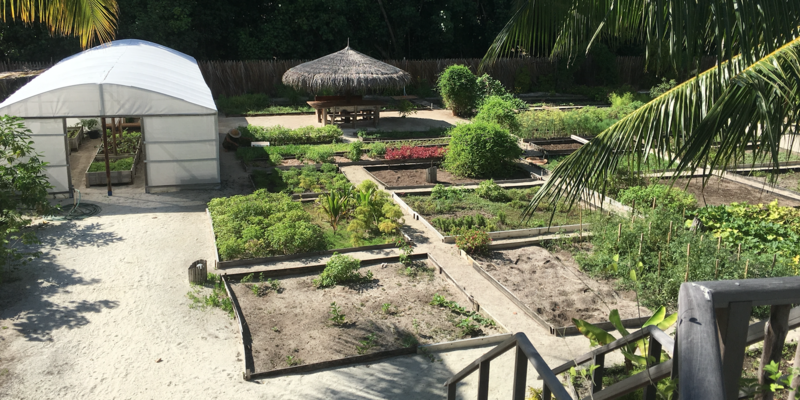 You have to keep in mind that many of the vegetables and herbs used in the hotel are organic and planted on the island itself, such as basil, mint, tarragon, beach lettuce, radish, etc… a luxury for those who can appreciate natural and organic products. To move about you can easily walk around the island, as everything is close by, however, if you don’t feel like walking you can always take advantage of the two bikes at your disposal in the villa. Furthermore, the hotel has only 45 villas (which is very few) and really, although the hotel is almost always full, you feel as if you were alone on the island because you rarely see other people, only at breakfast and dinner. For lovers of coral and marine life, the hotel has a dive and snorkel center. The center is coordinated by a charming girl called Josie who is a marine biologist. She coordinated our snorkel session and took us to the reef where we saw sharks (that eat small fish), turtles, and all types of fascinating colorful fish whose names I can’t remember. Fins, masks and snorkels are free and you can use them whenever you’d like since you don’t need a guided tour to snorkel. Of course, the first day when we arrived at our villa they were already there in the perfect sizes, given that we had filled out a form prior to our arrival. The last day, Mr. Friday was nice enough to take us to the Private Reserve. This is the luxury of all luxuries. It’s a villa far from the others that has 4 bedrooms, a gym, movie theater, massage room, water slide, infinity pool and lots of areas for recreation and rest where 10-12 people can fit comfortably. It also has two permanent Mr. Fridays living inside the villa. Words cannot describe this villa so I’ll let the pictures do it justice. Before leaving for the airport, the whole team was gathered again to say goodbye to us. Mr. Friday gave us a framed picture taken with a Polaroid of him and the two of us. This is what we call “attention to detail”. 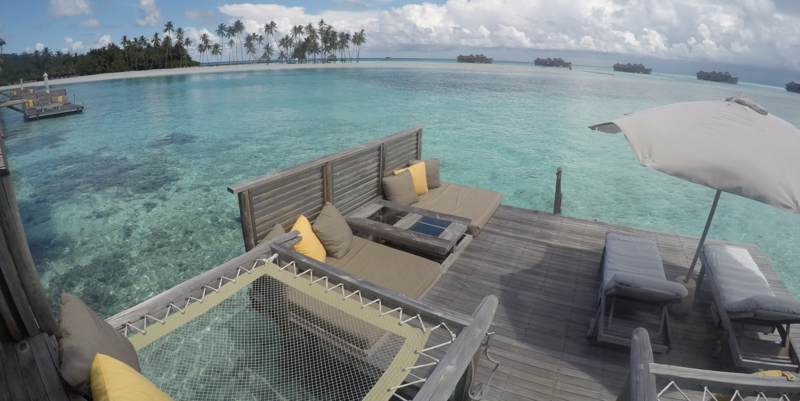 In conclusion, Gili Lankanfushi didn’t receive the TripAdvisor award for the best hotel in the world 2015 in vain. It’s a hotel where you feel as if you have disappeared from the world, with a rustic atmosphere and all the luxuries you could imagine. We really felt as if we were shipwrecked in the middle of the Indian Ocean.